One of our few native veronicas, but usually ± weedy in habit. The oldest Michigan collections noted are from Oakland Co. (1852) and Washtenaw Co. (1861). It grows in cultivated fields, flower beds, lawns; moist disturbed ground such as logging trails, gravel pits, shores; on limestone pavements, outcrops, and gravels; open moist swales and streamsides; and disturbed ground. Frequently confused with V. serpyllifolia by those not familiar with both. Besides the characters in the key, V. peregrina usually has nearly linear leaves, somewhat succulent in aspect, in contrast to the broadly rounded, sometimes even orbicular, blades that are usual in V. serpyllifolia. Furthermore, the latter is perennial. Scattered throughout the state are populations with short gland-tipped hairs on the stem (especially above) and in the inflorescence; these are var. xalapensis (Kunth) Pennell. MICHIGAN FLORA ONLINE. A. A. Reznicek, E. G. Voss, & B. S. Walters. February 2011. University of Michigan. Web. 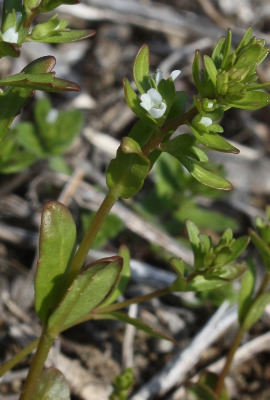 April 26, 2019. https://michiganflora.net/species.aspx?id=1981.